This lesson contains 17 pages of information with the focus on fine motor skills, crossing the midline, cross patterning and crawling activities. All of these experiences are hidden in the creativity of the activities offered, from stirring bowls of porridge or imitating an ant searching for it's breakfast. There are 2 original songs titled 'Porridge Hot or Cold' and 'Ants breakfast' to download with accompanying activities. 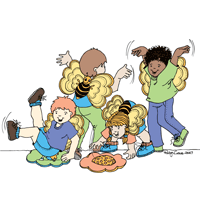 There is a traditional nursery rhyme "Pease Porridge Hot' to enhance individual and partner clapping experiences and rhythm stick activities. There are instructions on how to make your own rhythm sticks as well as a recipe for making porridge. Teaching points, a full colour illustrated Song Card, crawling activities and circuit set up ideas, Bean Bag Balance Cards to download with loads of accompanying bean bag activities and skill to share with the children. A lesson full of lots of original ideas! 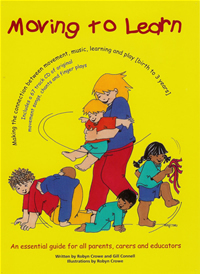 This lesson focuses on a variety of individual and partner body awareness activities, movement extensions and contains 20 pages of information, teaching points, safety aspects and lots and lots of ideas. 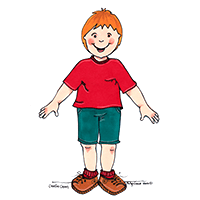 The lesson plan includes the favourite nursery song 'Head Shoulders Knees and Toes' with an array of very different and creative movement, co-ordination and spatial awareness activities to accompany the song. Also included is an mp3 file for the simple original song "Here Are My Arms",as well as directions on how to make a finger puppet, accompanying activities,and many spatial awareness and balance activities. This lesson also offers you 5 x full colour spatial awareness balance illustrations to download. Full of fun and creative ideas! This lesson contains 13 pages of activities that focus on the legs arms and the body and how that body part bends and moves. Songs include "Dance Little Bear" (original song) and a classical music compilation with accompanying movement and dance instructions. There are 3 x beautiful full colour balance illustrations, a full colour Song Card and an Activity Card, as well as large body part shapes to download and use to accompany the movement activities listed. Loads of teaching points highlight important developmental information throughout the lesson plan so you not only know what to do but why you do it. This 18 page lesson plan introduces a story about the bears not wanting to eat porridge and about their adventures.My original narration about these three bears can be downloaded to share at story time sessions with the children or they may choose to listen to it in a quiet corner of the room. The highlight of this lesson plan includes exquisite 6 x full colour Balance Cards showing bears performing the skills for the children to imitate. 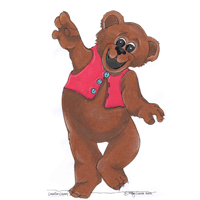 There is also an A 4 sized Song Card to download as well as an original song about a bear eating honey titled "Honey Pot", and original music titled 'Bear's Line Dance' to accompany the dancing activities that will motivate and excite the children to get up and move. There are also pages of facts and photos about bees and the honey making process to share with the children. All of these individual and partner activities are accompanied by teaching points and safety information. Join the bears for their adventures! This lesson plan contains 17 pages of activities and information to assist with rhythm , music appreciation and body awareness. 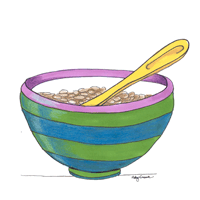 The original action song titled "Breakfast Boogie", encourages the children to use tap and stir and scrap the bowls for breakfast. It is a jazzy, catchy song and will be enjoyed by both adults and children. 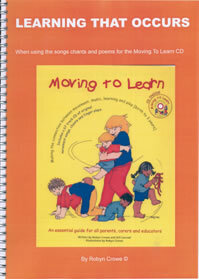 There is an A4 sized full colour illustrated Song Card to use when introducing this song. The concepts of fast, slow, soft and loud are introduced. There are musical and co-ordination activities using rhythm sticks, wooden spoons, plastic bowls and modified homemade drums. If you do not have any rhythm sticks as there are directions on how to make your own. Another original action song titled "Please and Thank you" invites discussion about manners and when to use them. Teaching points accompany the activities so join the bears for breakfast!. 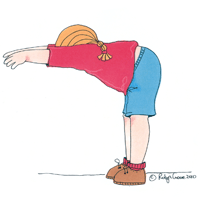 This lesson plan contains 21 pages of information and focuses on body awareness and balance. The original song 'Shake It' is a wonderfully energetic song that identifies parts of the body as well as an awareness of direction and spatial awareness. There is also original music titled ' Frog Boogie' to dance to, a jigsaw template to reinforce where the parts are on the body and encourages colouring, cutting and pasting skills. There are large body part illustrations, instructions on how to make a large cardboard dice for a body awareness activity, a Song Card, instructions on how to make musical instruments (wrist bells, shakers and maracas) and how to use them creatively with the children. There are activities using scarves, 12 x full colour balance illustrations, a lesson plan full of illustrations to guide you, plus essential safety and teaching points. There are also 3 simple chants for you to use to enhance the children's body awareness and sense of balance. Finally the manual that didn't come with the baby! 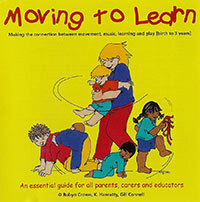 An easy to read book following the stages of a developing child aged birth to 3 years. It explains the why as well as how to spend time with your child. What are Dominant Movement Patterns? What if I can’t dance? 67 MP3's from the Moving To Learn CD... all digitized and ready for you to add to your MP3 player!